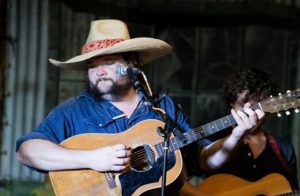 Buffalo Rogers is a singer/songwriter who has been playing his music regionally for the last dozen years. With a wonderful blend of rocking country/Americana/folk music, he pulls from his homeland, the wild central plains of Oklahoma. His songs have been recorded by the Damn Quails and many others. A multi-instrumentalist with a knack for showmanship and clever lyrics, he makes for a great show. Rogers is currently finishing up his new album, Fairplay Hotel.